The SD7 is a pistol-grip style HD TV camcorder that weighs just 290g. No sooner have we seen two new high-definition camcorders from Panasonic than a third one comes along to round out the line-up, albeit in Japan. 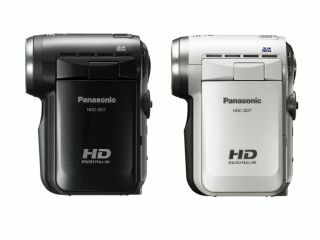 The newcomer is the HDC-SD7 and it stores full HD TV on SD cards instead of tape or DVD. In the current absence of Blu-ray or HD DVD video cameras , the SD7 compresses high-resolution video using the AVCHD format. As with the camcorders we saw yesterday, there are three CCD sensors that combine to give a 1920 x 1080i resolution. The ¥140,000 (£580) addition to Panasonic's stable is actually 50g lighter than yesterday's HDC-SD5 at just 290g, making it - yes, you guessed correctly - the world's latest lightest HD camcorder. All three new models are essentially the latest iteration of the groundbreaking HDR-HC1 we saw launched in Tokyo last November, which was the first SD-loving HD TV camcorder. All feature 10x optical zooms and the Pre-Rec time-shifting function we already know about.